Strong tubular steel frame, with steel mesh treads, and sprung retractable 80mm diameter rubber tyred swivel castors. Castors provide easy mobility when unloaded, but retract when body weight is applied, to anchor firmly in place on rubber feet. Platform W x D: 400 x 300mm. Tread W x D: 400 x 150mm. 3 year guarantee.Handrail options on 2 tread version. 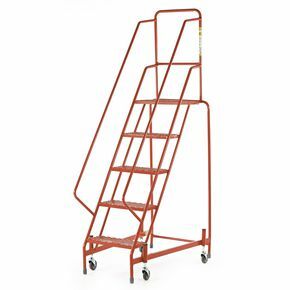 If your work involves reaching above ground levels often in different locations on premises you will require a piece of equipment that will allow yourself or employees to work efficiently. 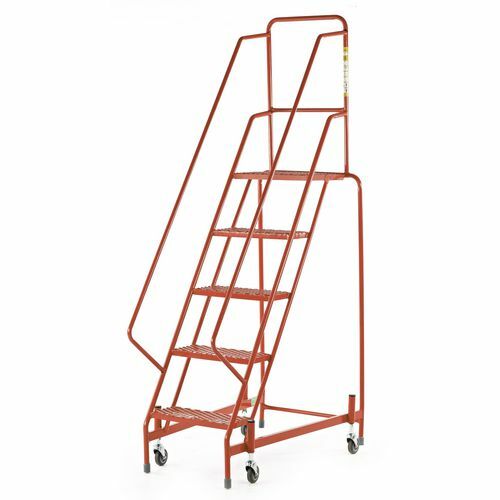 Our retractable wheel mobile steps offer an easy and fast way to move around an area and get to higher places. The strong tubular steel frame provides strength and support while the sprung retractable 80mm diameter rubber swivel castors provide easy manoeuvrability when unloaded. When body weight is applied castors retract and the step will remain firmly in place on the rubber feet, keeping the steps stable when they are being used to get to a high up place. The treads are made from steel mesh and there is a choice of five heights; 500mm, 750mm, 1000mm, 1250mm or 1500mm. There is a choice of colour; red or blue and the 500mm high steps have a choice of a single looped handrail or a full handrail (all other heights come with a full handrail). Our retractable wheel mobile steps are an easy and safe way to access places that are too high to reach without a ladder. They come with a 12 month guarantee and FREE UK Delivery.